Crystal-clear aquarium water not only looks good, it's also a sign you're providing a healthy environment for your fish. Fish waste, uneaten food and plant debris all make aquarium water cloudy and unattractive, raising its pH to harmful levels. Cloudy water can also be low in oxygen, making it difficult for fish to breathe. Regular water changes, using filters and an air pump, help keep its water clean and your fish happy and healthy. 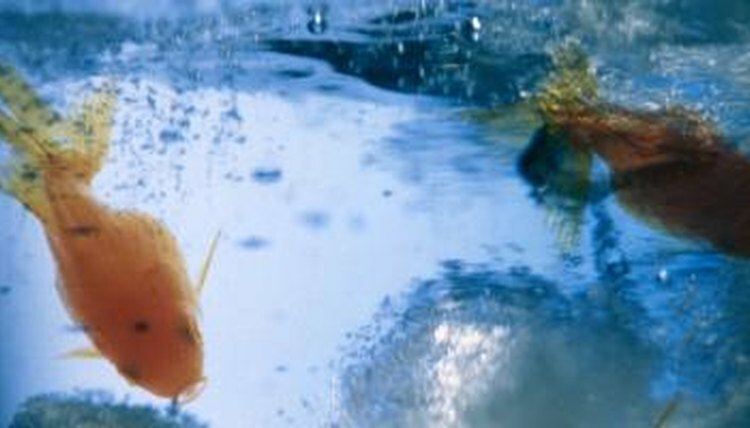 Changing a proportion of the water regularly in home aquariums helps reduce waste and cloudiness. Remove between 20 and 30 percent of the water every one or two weeks, and replace it with water that's been allowed to stand for two days. Aging the replacement water in this way allows chlorine to evaporate and the water to reach room temperature, avoiding shocking the fish. Tank water contains beneficial bacteria that help process waste, so don't replace more than a third of the water at a time. Marine tanks should always receive water with the correct salinity balance. Mechanical, biological and chemical filters remove solid and chemical contaminants from home aquariums. Remove and clean mechanical filters monthly, or according to the manufacturer's instructions, and check that biological and chemical filters aren't blocked with silt or solid waste, preventing the flow of water. Replace filter pads in chemical filters every month, and remove half of the biological media in biological filters if they're completely clogged. Biological filters contain living bacteria, so clean them gently in fresh water or clean marine aquarium water, and don't allow them to dry out. Air pumps dissolve oxygen from the air into aquarium water, so that fish can breathe and so the water doesn't become stagnant. If your tank doesn't have an air pump, install one as soon as possible. The pump draws air from outside the tank and releases it through an air stone. Connecting the air pump to an under gravel filter combines water oxygenation with filtering. Releasing air in a narrow space beneath the gravel at the bottom of the tank moves water through the gravel, helping to trap debris and fish waste. Algae is a green slimy substance that grows on aquarium walls and decorations. Remove it at the same time that you change the water. Use a soft plastic scraper to remove it from the glass, and take out and wash aquarium ornaments under fresh water. Siphoning debris from gravel also helps keep the water clear. Uneaten food contributes to algae build-up because it feeds on the nutrients in the water, so remove food waste with a net every other day.